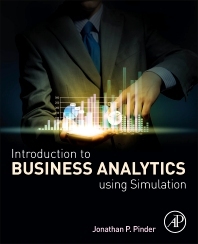 Introduction to Business Analytics Using Simulation employs an innovative strategy to teach business analytics. It uses simulation modeling and analysis as mechanisms to introduce and link predictive and prescriptive modeling. Because managers can't fully assess what will happen in the future, but must still make decisions, the book treats uncertainty as an essential element in decision-making. Its use of simulation gives readers a superior way of analyzing past data, understanding an uncertain future, and optimizing results to select the best decision. With its focus on the uncertainty and variability of business, this comprehensive book provides a better foundation for business analytics than standard introductory business analytics books. Students will gain a better understanding of fundamental statistical concepts that are essential to marketing research, Six-Sigma, financial analysis, and business analytics. Dr. Pinder's research has been published in Decision Sciences, the Journal of Operations Management, the Journal of Forecasting, the Journal of Economics and Business, Managerial and Decision Economics, the Journal of the Operational Research Society, Decision Sciences Journal of Innovative Education, and Decision Economics, among others. Dr. Pinder has received numerous teaching awards. He is a member of the Decision Sciences Institute and the Institute for Operations Research and Management Science.